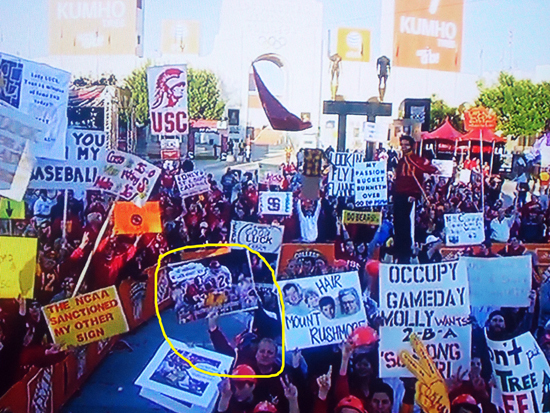 I’ve talked before about how much I love college football so when I heard the ESPN College GameDay crew was going to be in Los Angeles this weekend for the USC and Stanford game, I had to make the two-hour trek north. 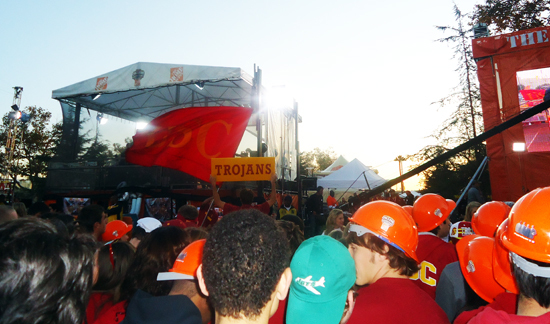 I wanted to go primarily to record for other college football fans how to make the most of the experience, in the event ESPN’s College GameDay comes to your town. I hope you find these tips helpful. 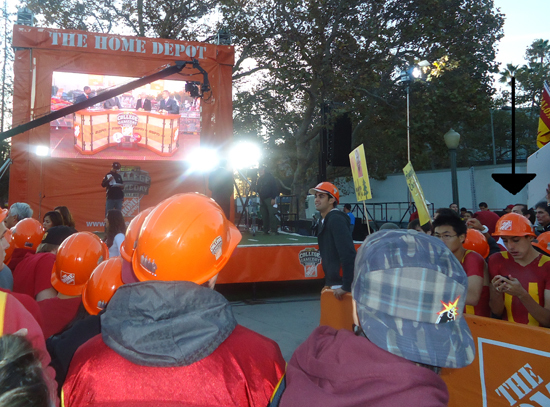 Planning – If you live within two hours of a major college football campus, there is a good likelihood that sometime during the season the College GameDay crew will be coming to your town. They usually select which school they will be visiting a week prior on Sunday or Monday. You can check out where they will be on their website or Facebook page so if you see they are coming your way, make sure you to attend the live taping as it is a lot of fun. Additionally, head to the Home Depot and grab a few pvc pipes or wood poles to affix signs you make for a better chance of getting them on the show. 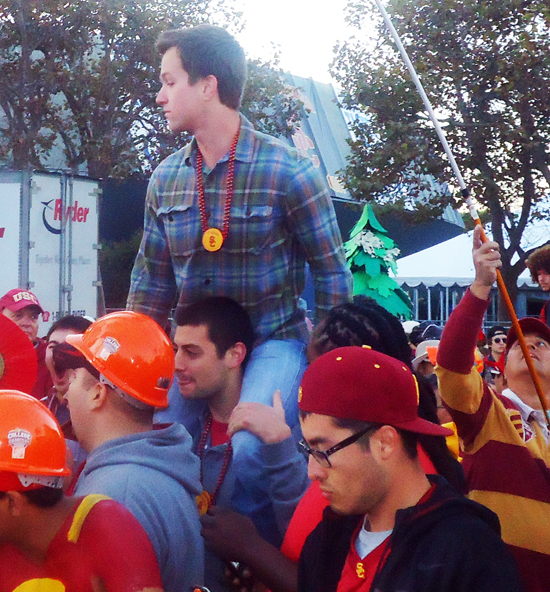 If you don’t have a pole, you may have to go old school and put your buddy on your shoulders to get your sign on the show. Putting your sign on a pole will help get it up higher where it can be seen behind the hosts. Preparation – Get your rest the night prior as the show starts taping live very early in the morning in most cases and you want to be on your “A” game. Make sure you eat a little something as well beforehand as the show goes full steam ahead for a full two hours. 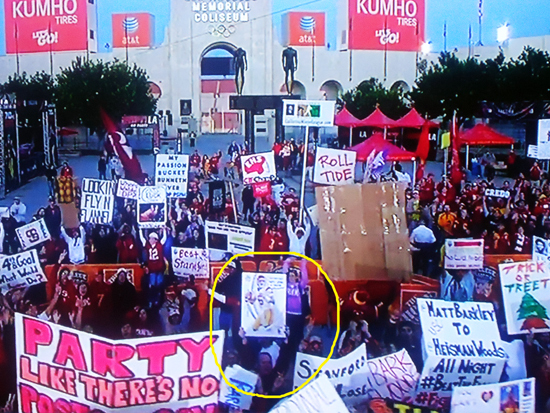 A booster club was handing out free breakfast burritos to USC supporters there on campus so that was nice, but don’t plan on that happening at every campus they visit. Additionally, make sure you do not wear sandals or flip flops. I made the mistake of wearing a pair of flip flops and my feet got stepped on more than a few occasions once the cameras came our way and people crowded in one area. Lastly, remember to set your DVR to record the show and have it run about 5 minutes after the show as well since they tend to run long. 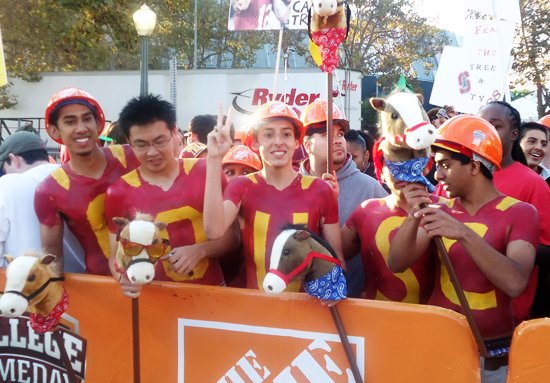 Apparel – Most everyone wore their favorite college colors for the show, but the cameras do get drawn to those who are especially spirited. If you want to grab a group of buddies and paint your chests, there is a good chance the cameras will find you. If you want to go super extreme and dress in some type of costume, as long as it is not profane, the camera will likely look your way. 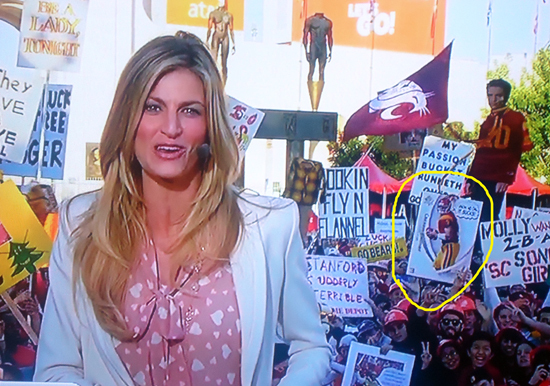 The more outlandish you look, the better your chances of having the camera on you on GameDay. Where to Stand – Once I got there, I was realized this was kind of a big deal as a couple thousand fans were all crammed around the back of the stage. You have two options upon arrival to either wait in a small line and enter the pit area directly behind the stage or remain outside the steel barriers on the outskirts. I thought going in the pit would give me the best opportunity to get some TV time, but I was wrong, it would have been better if I had stayed outside. 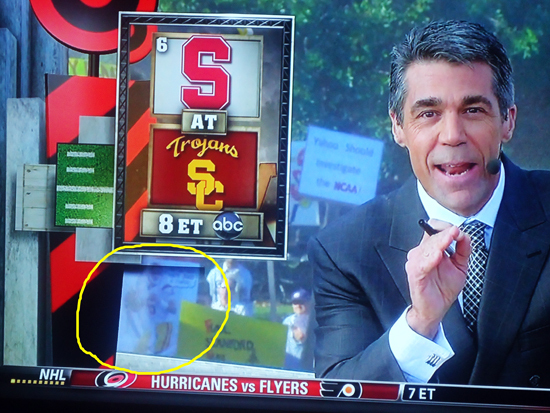 These guys are the Sign Police for ESPN and they will check your signs to see if they are okay for TV. 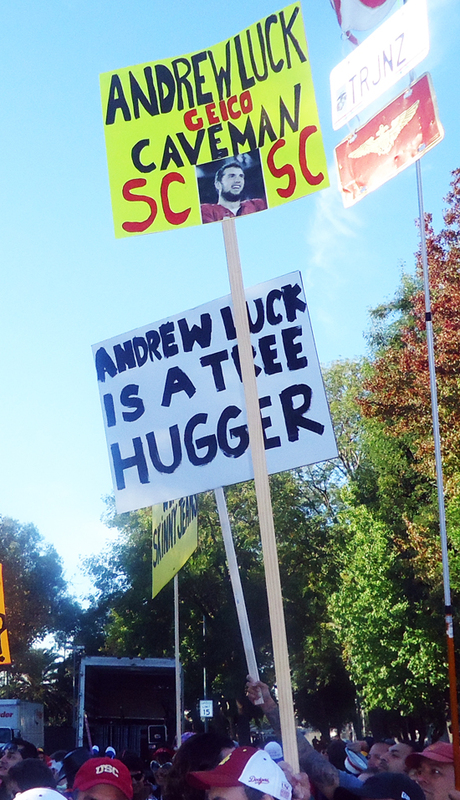 They don’t let much slide and are not afraid to confiscate signs in question with the help of campus police. If you head into the pit they will not allow you to bring any food, drink, tape, markers or poles in. Most importantly, the “Sign Police” will check your signs and also search you (really well) to make sure you do not wreck the production by showing a sign that may be profane or controversial. 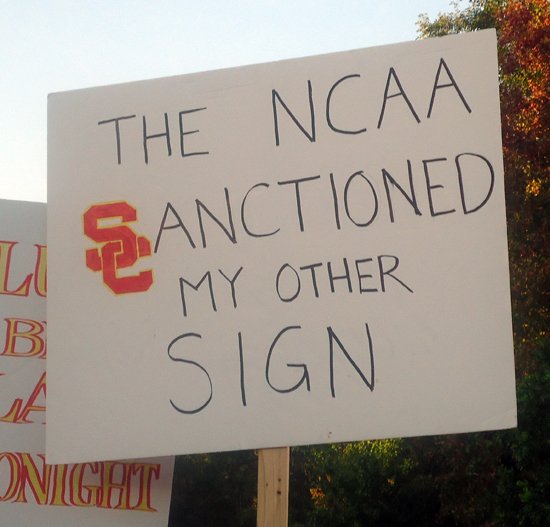 I had a sign about sanctions that they wouldn’t let me bring into the pit, but several other signs mentioning sanctions were displayed and seen on TV because they stayed outside. Additionally, I gave up my poles to enter the area and I could have gotten much better coverage if I kept the poles and stayed outside. The best area to be from what I saw would be outside the pit, beside the side stage, in front of the large video screen that televises the show live. That will give you great coverage behind the crew most of the day and the freedom to not have to use poles. It is crazy during the show and with thousands of fans in attendance, it can be difficult to figure out where to go to get on TV. 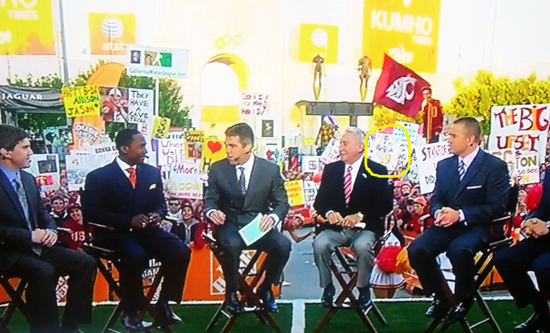 The guy under the arrow is in the perfect spot for TV time. 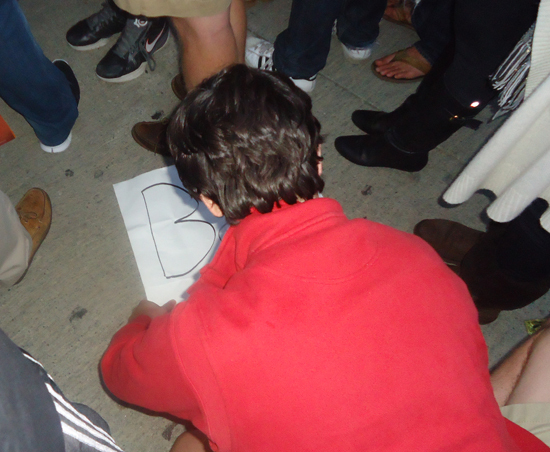 He’s outside the main pit, on the barrier, in front of the side stage. Now if you have anything controversial, the show security known as the Sign Police work with campus security to have those signs confiscated. So be careful about putting anything out there that is not in good taste as it will likely get taken away from you. 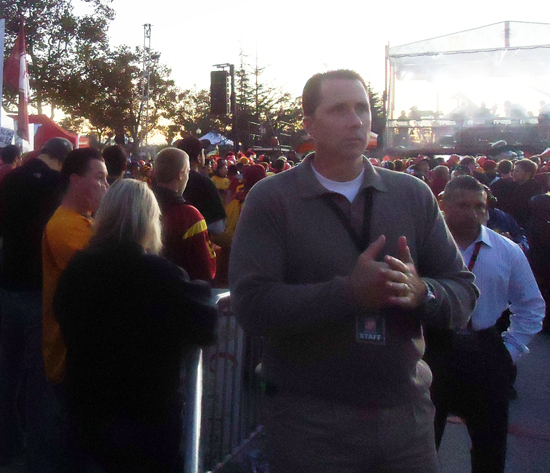 If you have anything too disparaging about the teams or players, they can be confiscated. Most people really walk on the fine line there and there is definitely a gray area as there were some signs they let slide initially, but claimed later in the show. 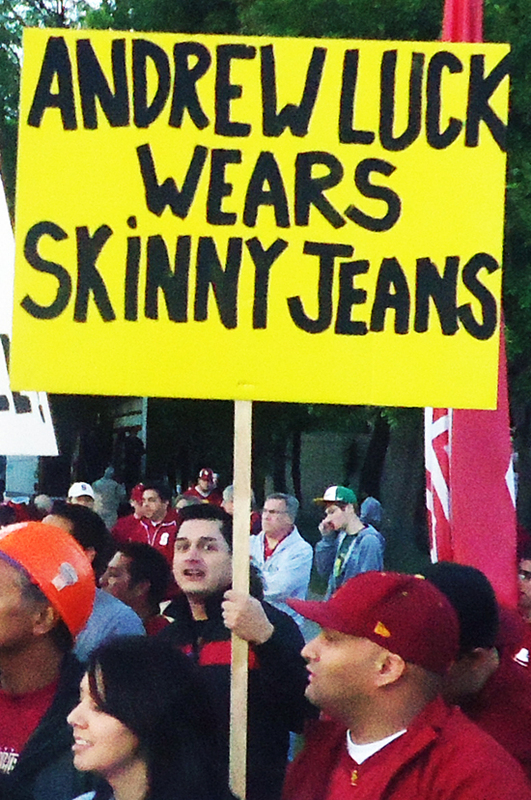 Signs like this got snatched up pretty quick by the Sign Police. Sneaking in Signs – Certainly I am not advocating fans sneak signs into the pit area, but I did see a few people accomplish just that. 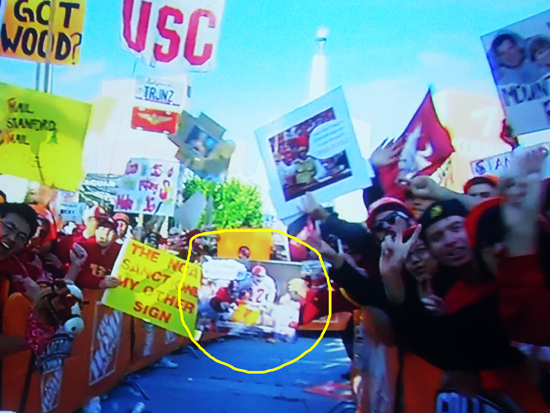 A couple fans I saw used the other side of their approved sign and snuck in a marker to make a new sign. Don’t ask me where they hid that marker as the security group was very thorough when they checked me. The best idea I saw was a guy who sandwiched his “bad” sign in between one that would get approved and a blank white sign. It just looked like a thicker sign to the security group. He even applied clear tape to it along the sides so it appeared like one regular sign. Once he cut it open however, he was able to bring the other sign out. As I’ve shared earlier, it doesn’t make too much sense to sneak in a sign like that as they quickly find you and will have it confiscated. Oh, and you’ll likely be removed as well. A young student next to me had snuck in a marker and made a new sign on the back of his approved sign. It wasn’t long before this one was claimed and he was removed from the area. Celebrity Guest – Each week the show has a different celebrity guest on towards the end to pick games. 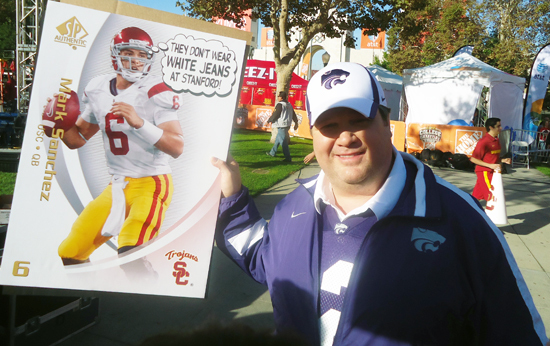 For the USC game, it was Eric Stonestreet from ABC’s hit comedy “Modern Family.” He was decked out in his Kansas State gear in hopes they could beat Oklahoma so he likely had a depressing afternoon after the Sooners crushed the Wildcats. 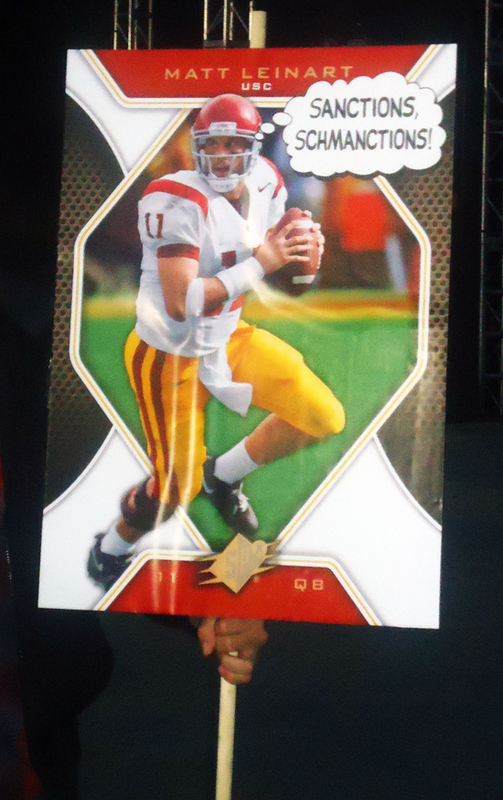 I was able to chat with him a bit after the game however and he enjoyed some of the signs we had made, especially this Mark Sanchez sign featuring the former USC star on a SP Authentic card. 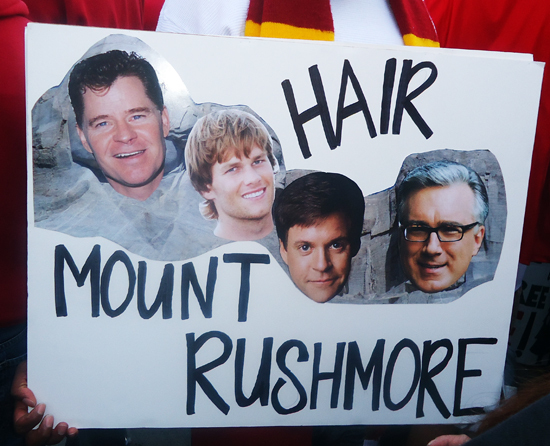 Eric Stonestreet of ABC’s “Modern Family” liked our sign featuring Mark Sanchez the best. Ha Ha! That was awesome, Chris! Very cool!! 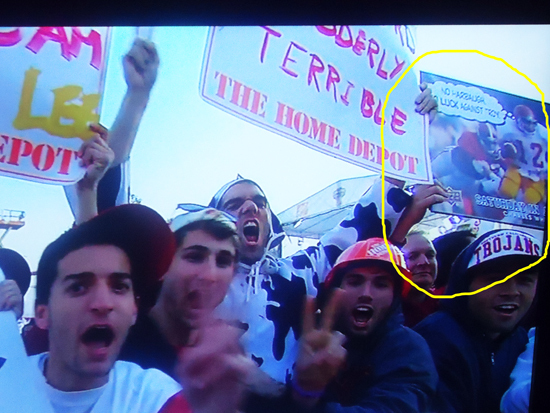 Dont live anywhere near the set but its awesome to see product on tv. Great Blog post!! 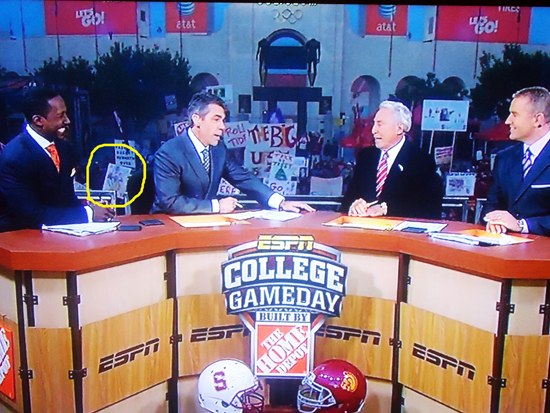 I am heading to Gameday this weekend myself (Stanford/Oregon) to try and get some photo’s of the entire scene. 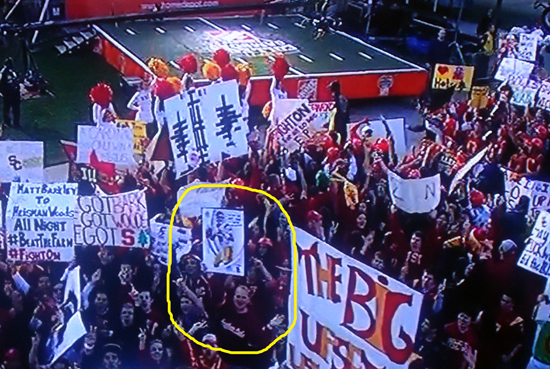 What would be the best area to see the gameday crew from, inside the pit? Going to Game day this weekend for Temple Owls game! Woohoo cant wait. Never thought about signs…maybe Ill try it? Sounds like fun, my son want to go so Im taking him..he is so excited to be part of such a fun/exciting atmosphere. 15 years old and very much into college football. Cant wait!